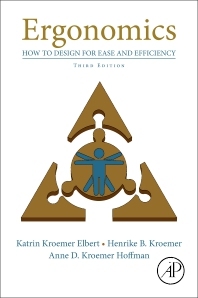 Ergonomics: How to Design for Ease and Efficiency, Third Edition updates and expands this classic guide, including the latest essential themes and regulations. An introductory section provides all of the physical and mental ergonomics theory engineers, designers, and managers need for a range of applications. The following section provides authoritative advice on how to design for the human in a range of real world situations, now including new content on subjects including the individual within an organization, planning for space journeys, taking back control from autonomous systems, and design for aging. Retaining its easy-to-use layout and jargon-free style, this book remains an invaluable source of models, measures and advice for anyone who needs to understand ergonomics. Dr. Elbert has worked in research and development in the medical device industry as a mechanical engineer for over two decades. Her focus has been on design and development of surgical implants and associated instrumentation with Stryker-Howmedica orthopedics and Johnson & Johnson’s Ethicon. She holds an undergraduate engineering degree from Virginia Polytechnic Institute and State University (Virginia Tech) and master’s and PhD degrees from Cornell University in mechanical engineering, as well as additional certification in engineering management from Stevens University, project leadership and Six Sigma methodology. She has patents and publications in the surgical and orthopedic literature. Dr. Kroemer has worked in various clinical settings as a clinical psychologist for 25+ years, focusing on health psychology and clinical psychology in private practice and as a consultant. She holds a PhD in Clinical Psychology from Temple University in Philadelphia PA and completed her postdoctoral fellowship in Health Psychology and Consultation-Liaison Psychiatry at Henry Ford Hospital in Detroit MI. She specializes in consultative evaluations for the Veterans Association, the Department of Health and Human Services, and bariatric and spinal surgeries while focusing her clinical practice on the evaluation and treatment of mood, adjustment, and eating disorders. Anne Kroemer Hoffman received her MBA from the University of Virginia’s Darden School of Business. She has worked in client service and advertising with Leo Burnett and J Walter Thompson, in a large Chicago-based social service agency as Director of Marketing and Development, and in a community-based organization as Director of Outreach and Marketing. She is currently a free-lance marketing, communications, and social media consultant in Chicago specializing in proposal development, social media, influencer marketing, and other writing projects.